Saturday evening October 22, 2011 at 10.48 p.m. a curious car accident happened at the intersection of St Paul and Beacon Street in Brookline, Massachusetts. A peculiar view appeared that felt more like a dream than reality. 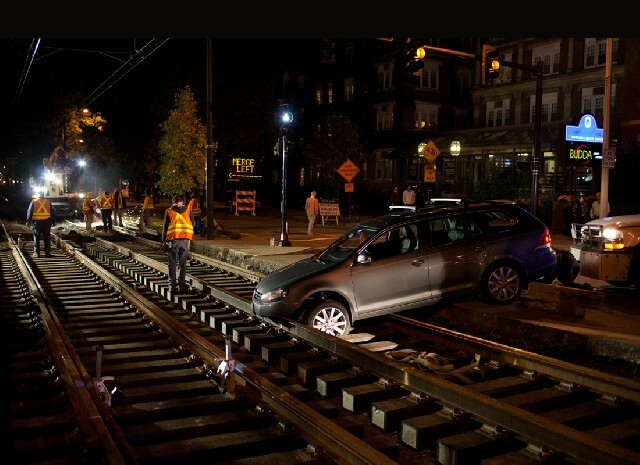 A gray VW station wagon dipped nose down and got stuck into a two feet open space pit of the green line MBTA construction site replacement tracks. 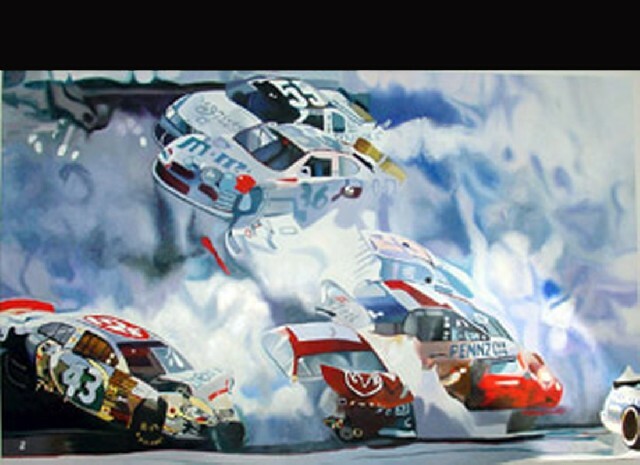 Paintings of car crash unraveled through one’s memory. Is it a Malcolm Morley Two Brushes with Death painting or is it an Andy Warhol Death and Disaster series that one was contemplating. Rushing to the accident site, asking questions to the dozen Brookline and MBTA Police officers; to the public workers and the witnesses did not elucidate the situation. The spectators were somehow stunned and quite dazed by the site of the floating car. Amidst the ambulance and firefighters sirens an eerie atmosphere reigned. The Brookline Police in particular had no comments remaining completely mute on the subject ushering the onlookers to leave the scene. The only information leaked was that a couple was in the VW and that both were transported to a nearby hospital. The watchers kept hammering at the same questions: why there were no clear signs indicating the work area? Were there enough orange safety cones to clearly signal the site? Why were there no police cars blocking this dangerous on-going construction site? Regrettably, this was not a representation of the accident nor a painting but a real occurrence where two persons were hurt from the lack of public safety measures. Watchers wondered if the driver was drunk? Who is responsible? Is it due to the negligence of the MBTA or the city of Brookline? Confronted with many questions that remained unanswered, the crowd muttered disbelief in the face of the betrayal of the public trust. Some commented on the inappropriate use of the tax money and the public workers work ethics, others suggested staging civil disobedience sit-ins and manifestations to have safety procedures implemented and enforced. 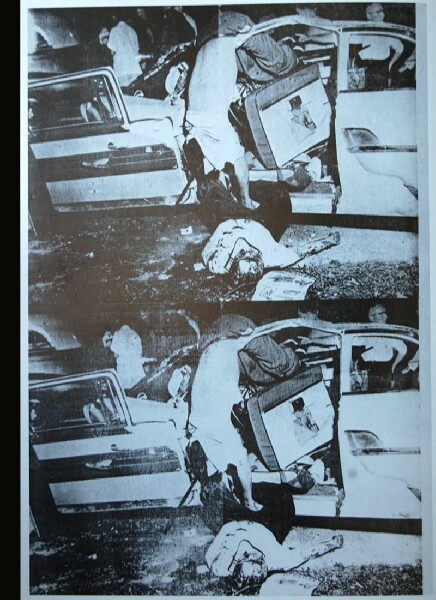 This car crash image is a photorealism framework that can easily be placed into the context of art as Warhol did in his series. It depicts a horrific scene its narrative may or may not be obvious, but it is symbolic of death and disaster nonetheless, mirroring a moment in society through media and technology. Like the degradation of writing skills – grammar, syntax, sentence structure, even penmanship – that come with digital technology; lack of safety, degradation of institutions, budget cuts come as a result of the current economical crisis. It seems that somehow art remain the transcendental nirvana and evasion from this gruesome reality. Looking at a painting of an accident by Warhol, Morley or other artists create indeed a range of emotions and intense signifiers that are desirable metaphors lifting our collective memory to a different layer of truth and awareness shielding us from the physical pain accidents can inflict. We are indeed lucky to have art as a haven to retreat to.